On Saturday night the short-handed 76ers gave the New York Knicks a tremendous fight, but were eventually bested by a fade-away jumper at the buzzer from the All-Star simply known as “Melo”. The loss dropped the Sixers record to 22-36 on the season and with a brutal schedule the rest of the month, my training camp prediction of a 35 win season now seems like a pipe dream. Still, for the most part I have truly enjoyed watching this group of rookies and undiscovered “prospects” play basketball this season as “The Process” moves ever forward. Additionally, there have been a few positive revelations we can take from the first half of the season. It’s become very obvious that when healthy, Joel Embiid is a superstar caliber player. There is now little doubt that rookie Dario Saric will thrive in the NBA. Robert Covington has proven to be a solid “three and D” role player. 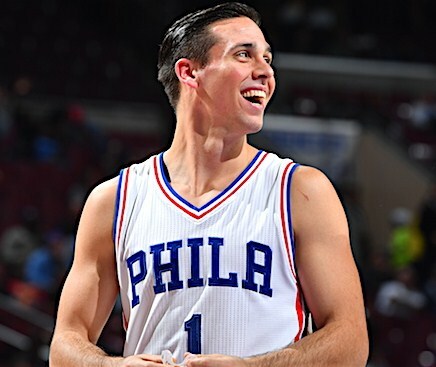 Finally, TJ McConnell has shown that he can be a rock steady point guard in this League. To most, the last positive item is the biggest revelation of all. Nearly everyone in 76ers nation and around the Association in general has been shocked by McConnell’s ability to compete at the NBA level. In his last five games the undrafted 2nd year player out of Arizona is boasting stats line of 10.8 ppg. and 8 apg., while shooting a ridiculous 57% from the field and holding his own against the elite guards in the NBA. However, if you look at McConnell’s basketball resume, talk to his dad and his former college coach, you’ll find that we should NOT be the least bit surprised at the success McConnell is achieving with the 76ers. And Mr. McConnell knows talent when he sees it. As a high school basketball coach at Chartiers Valley HS just southeast of Pittsburgh, coach McConnell has racked up 500+ wins 5 section titles, five WPIAL titles and two state runner-up finishes. Once TJ was done toying with helpless middle school opponents in the Pittsburgh area, he went on to dominate at the high school level while playing for his dad at Chartiers Valley. TJ received his first scholarship offer (from Duquesne) after his freshman year of high school. He scored over 2,000 points in his career including a legendary 52 point outburst against West Mifflin. Triple-doubles were the norm (points, assists, steals). As a senior he averaged 34.2 points, 8.2 rebounds and 9.1 assists per game, earned first-team all-state honors, was named the Associated Press’ Pennsylvania Class 3A Player of the Year, and was also named the male athlete of the year for all sports by the Pittsburgh Post-Gazette. The hardware train didn’t stop when he TJ went to college either. TJ played two years at Duquesne where as a freshman McConnell averaged 10.8 points, 3.8 rebounds, 4.4 assists and 2.8 steals per game, earning 2011 Atlantic 10 Freshman of the Year honors. In his sophomore season as a Duquesne his stat line improved and he was selected to the 2011 Atlantic 10 All-Defensive Team. As we all have read by now, McConnell had a basketball epiphany, departed Duquesne and transferred to Arizona. There he led Sean Miller’s Wildcats to back-to-back Elite Eight appearances and further padded his already impressive basketball resume. As a junior he was a 2nd team All-PAC12 selection. As a senior McConnell posted 10 points and 6 assist per game and at the end of the 2014-15 season, he moved up to the All-PAC12 first team and was only a couple of votes away from being the Player of the Year. But it wasn’t his stat lines that impressed Arizona Head Coach Sean Miller the most, it was TJ’s intangibles. ”He was as consistent of a player as I have ever coached,” Miller said about McConnell during his weekly media gathering on November 5th. “Not until somebody like that is gone do you completely understand all of the qualities that he had. His practice habits, his leadership, his toughness, his great character and competiveness and certainly his ability of the court,” Miller continued. Since joining the 76ers, McConnell has shocked the Sixers faithful, wowed Head Coach Brett Brown and taken opponents by storm. According to basketball-reference.com, McConnell has even written his name in the history books — during the 2015-16 season, he became the first player in League history with three 12-assist performances through his first eight appearances. Still, none of this most recent basketball success comes as a huge shock to his high school coach/dad. “I’m surprised that he’s playing this much early on. I thought it would take a little time to get acclimated and get a feel for the NBA game,” coach McConnell said when asked about TJ’s solid point guard play over the last two seasons. Well, Mr. White, after his latest stretch of outstanding play as the starting point guard for our Philadelphia 76ers, that time is now.